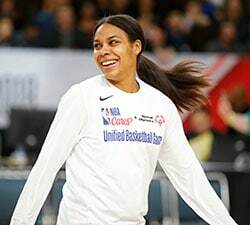 LOS ANGELES – With 1:58 to play in the first quarter, Candace Parker took a pass from Alana Beard in the lane, turned over her left shoulder and lofted a hook shot over Natasha Howard that fell through the hoop to give the Sparks a 30-8 lead and essentially a first-quarter knockout. Candace Parker, who after the game said she had been “non-existent” in every game against the Lynx this season, had single-handedly outscored the Lynx 10-8. The Sparks had scored more points off Minnesota’s six turnovers (9) than the Lynx had in total (8). The Sparks had made four more shots (13) than the Lynx had attempted (9). “Everybody across the board, we came out with a fight, we came out with a desire, we came out with a purpose and we didn’t do that in Game 2,” said Parker. There were so many words being thrown around after the game to try to accurately describe the effort put forth by the Sparks to open Game 3 that it was as if a thesaurus was being passed around to the players and coaches so they wouldn’t say the same thing. Whether you choose to go with relentless, persistent, aggressive, attacking or determined, you would be correct. The Sparks opened this game playing at as high a level as they had this season. The Sparks hounded the Lynx on defense as they forced turnover after turnover to create easy transition opportunities on offense. And even when they had to settle into a half-court set, their mindset remained the same. “We had a game plan of just going to the basket and trying to be aggressive,” said Parker. 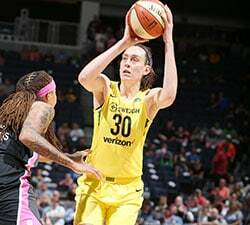 In the first minute of the game, the Sparks constantly challenge Sylvia Fowles at the rim and the Defensive Player of the Year responded with three of her five blocked shots coming in the game’s first 59 seconds. But the Sparks were not going to be denied. They were not going to be intimidated and settle for outside shots like they did in Game 2. They were going to continue to attack the basket and dictate the action on both ends of the floor. The Lynx came nowhere close to matching the passion and determination that the Sparks showed early on, much to the chagrin of head coach Cheryl Reeve. While Parker and Ogwumike did much of the damage – scoring 24 and 21 points, respectively and each grabbing nine rebounds – the Sparks got contributions from up and down their roster, which allowed them to fend off every Lynx attempt to try to chop into the Sparks’ lead. Game 1 hero Alana Beard once again gave the Sparks an offensive punch to go along with her usual outstanding perimeter defense. She finished with 15 points and a game-high seven assists to go with two steals and a block. Meanwhile, Essence Carson added 16 points and shot a perfect 4-of-4 from beyond the arc. “It was huge,” said Kristi Toliver of the contributions of Beard and Carson. “E has been putting in a lot of work on her jumpshot, before and after practices, days off, so its good to see her reap the benefit of her hard work. And AB is just being aggressive. Toliver was the only Sparks starter to not reach double figures in scoring and that was perfectly fine for the shooter-turned-point guard. 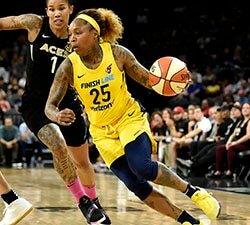 After having their energy and effort questioned following their Game 2 loss in Minnesota, the Sparks responded with resounding wins in all of the hustle plays. After being outrebounded by 22 boards through the first two games of the Finals, the Sparks won the rebounding battle 29-24 on Friday, including an 11-5 edge on the offensive glass. The Sparks converted those offensive boards into 14 second-chance points and took full advantage of the Minnesota’s 13 turnovers by translating them into 24 points. 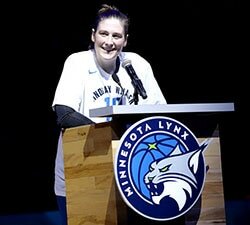 “I don’t think there’s much to explain other than what you saw,” said Minnesota’s Maya Moore after the game. “You know, when you have such a long, aggressive, athletic team as L.A., we have to be able to respond and anticipate ways to get out of their pressure because they converted those turnovers into fast break points, transition, easy points, where we can’t even give our defense a chance to stop them. The Sparks are now just one win away from their first title since 2002 and the first title for every member of this roster. Can the Sparks replicate what they did Friday night one more time as they try to close out this series on Sunday at Staples Center?